EASILY CLEAN YOUR DIGITAL DEVICES! 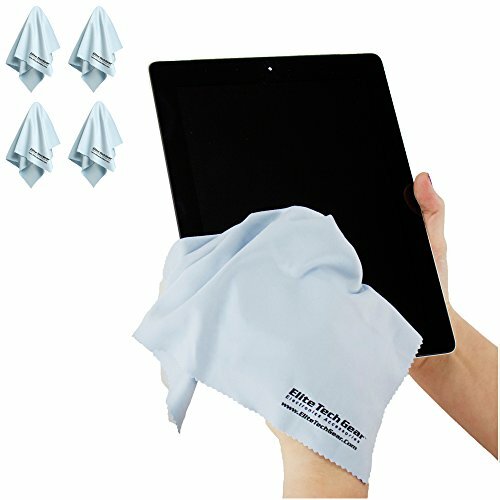 Elite Tech GearTM Microfiber Cleaning Cloths make it safe, easy and convenient to clean your Cell Phone, Tablet, Laptop Screens, Camera Lens, Eyeglasses, Sunglasses and More With These Amazing Breakthrough Technology Cleaning Cloths. These make GREAT GIFTS for Family, Friends and Co-Workers. Avoid scratches, streaks or marks leaving your surfaces crystal clean and clear. Made with the highest quality materials. These cloths are soft to the touch and have saw tooth pattern edges which will not fray like other cloths that have unfinished edges. Cleans pesky smudges and fingerprints off your Electronic Device Touch Screens and Other Delicate Surfaces like your Apple, iPod, iPad, Mini, Mac, laptops, iPhone 4, 4s, 5, 5s, 6, Samsung Galaxy Tab, S3, S4, S5, HTC, Amazon Kindle Fire HD, SLR, Nikon, Canon Lenses, LCD TVÕs, and Jewelry. Exclusive Multi-Pack includes 4 ÒOVERSIZEDÓ Cloths = 12 x 12 inches and made with Advanced Microfiber Fabric Technology. Each cloth is individually wrapped making them easy to pack or store and are perfect for personal, business and commercial uses as well as for home, automotive, boat and car as an interior towel. SPECIAL BONUS: You will be given a unique link so you can view 2 special videos on How To "Use" and "Care" for your new Cloths. NOTE: Your cloths are Environmentally Friendly, are reusable, easy to wash and are quick drying. Backed By Elite Tech Gearª No-Hassle, No Questions Asked, 100% Money Back Lifetime Guarantee! Click the Button "Add To Cart" at the Top of This Page to Keep Your Screens, Eyeglasses, Camera Lenses and More Crystal Clean and Clear. ON SALE 40% OFF - SAFE & EFFECTIVE. Premium Quality Ultra Fine Microfiber Cleaning Cloths won't scratch your device screens, leave streaks or marks and are a safe and effective way to clean your delicate surfaces leaving them crystal clear. These make Great Cool Gifts for Family, Friends and Co-Workers. CONVENIENT. Your Amazing 4-Pack Set is perfect for your consumer electronics accessories and means you have a cleaning cloth anytime anywhere you need it making it very easy and convenient to clean your ATT, Verizon, Sprint, HTC, Nokia, Blackberry, Sony, Razor Cell Phone, Computer, Tablet, Laptop, Apple Mac, iPhone 4, 5, 6, 7, 8, iPads, mini, iPod, Galaxys, LG and Amazon Kindle Fire hd Touch Screens, SLR, Nikon, Canon, Digital Camera Lens, Eyeglasses, Sunglasses, LCD or Plasma TV and Jewelry. EXCLUSIVE PACK. Economically cheap Must Have accessory. You get 4 Blue Large "OVERSIZED" 12x12 in. cloths. These cloths are compact and come in cute individually wrapped packs and are perfect for personal, business and commercial uses as well as for home, automotive, boat and car as an interior towel to wipe off smudges leaving delicate surfaces like your GPS screens lint free. Great to carry in your pocket, backpack, purse or glasses case. TRUST. Customer service with Elite Tech Gear is unmatched. We are genuine, honest people you can actually email and talk to. Try us! Your bag of cloths are backed by a 100% Lifetime Guarantee. BONUSES. You get 2 FREE Bonus links to 2 Videos that show you how to "Use" and "Care" for your new high quality cleaning cloths. Also, they are Environmentally Friendly, are reusable, easy to wash and are quick drying. If you have any questions about this product by Elite Tech Gear, contact us by completing and submitting the form below. If you are looking for a specif part number, please include it with your message. Retro Musique LP Cleaning Kit - Everything You Need To Protect Your Vinyl Records and Enjoy the Best Possible Sound.